In August we went to explore Cornwall. We are making a film, here is a short trailer. To find out more, read the article bellow. This was a trip planned somewhat impromptu. 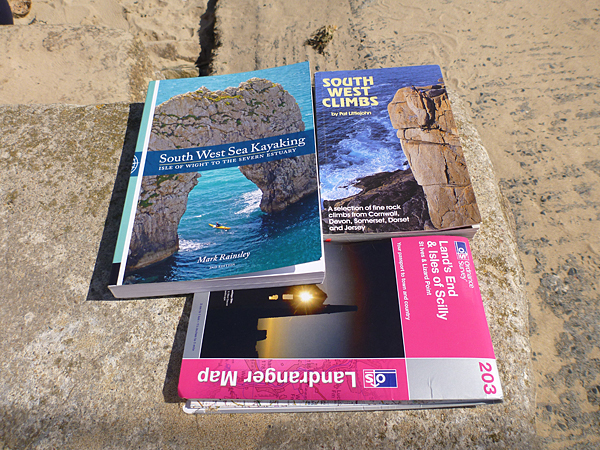 We were three keen kayaker/climbers ready for a nice little adventure along one of Britain’s grand coastlines, only could not decide which one. If it wasn’t for me, or rather my restrictive holiday allowance, we would have gone to the Outer Hebrides, but instead we had to settle for closer to home. 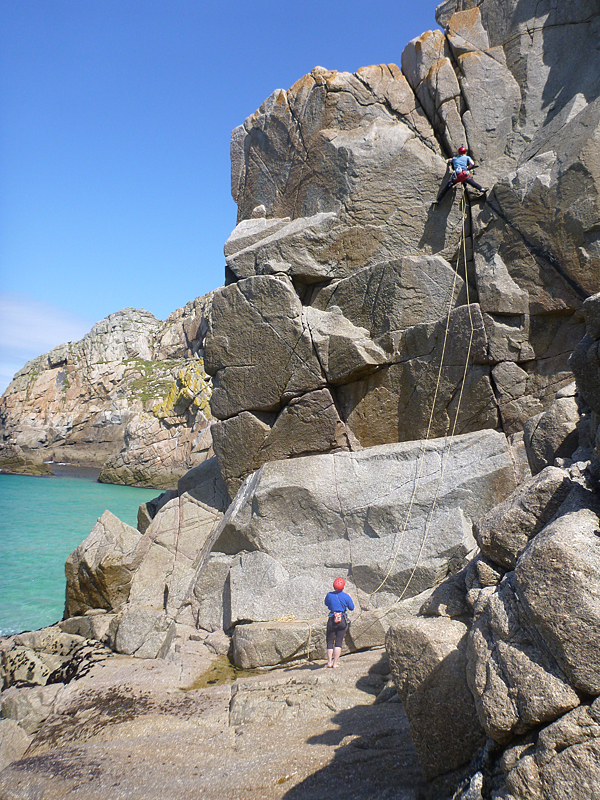 Cornwall, we all know, is a paradise for climbing the sea cliffs and sea kayaking. It did not take us long to agree that this would satisfy us. Slowly the plan developed. We would start in the vicinity of Penzance and end in the vicinity of St Ives. A sober and realistic target that would firstly allow us plenty of time for kicking back and sipping on good double malt while watching the wide screen super high definition Atlantic sunset each evening. Secondly, to explore the coastline in a fair amount of detail using, in no particular order, paddles, kayaks, ropes and harnesses. Where we would overnight would be a decision we would make by committee each afternoon. It was an uncomplicated and flexible plan… perfect! The charming fishing hamlet of Mousehole (‘mowzel’ in Cornish) seemed a fitting place for us to set sail. The lichen covered granite buildings lining the edge of the harbour and tightly packed together up the hillside caused our biggest challenge of the day, negotiating the steep and narrow streets with an estate car laden with long kayaks… and nowhere really to park. Natalie managed to blag the car park keeper who allowed us close to the harbour mouth to unload and pack the boats. After packing, lunching and parking the car we were waving goodbye to our new friends as we paddled out past the stone breakwaters at the mouth of the harbour. Fully laden with supplies for a week, including camping and climbing gear made manoeuvrability our biggest constraint, what we needed was an outboard motor to get us to our over night camp. We passed some lovely landmarks, first was the actual ‘mouse hole’; a cave said to have once been a smugglers hideout on the cliffs facing the sea just south of the village. After a series of beautiful rocky cliffs and coves we paddled around a headland and were greeted by Minack, the stunning granite open air theatre, hand built by Rowena Cade over her lifetime. We needed to find a bed for the night. 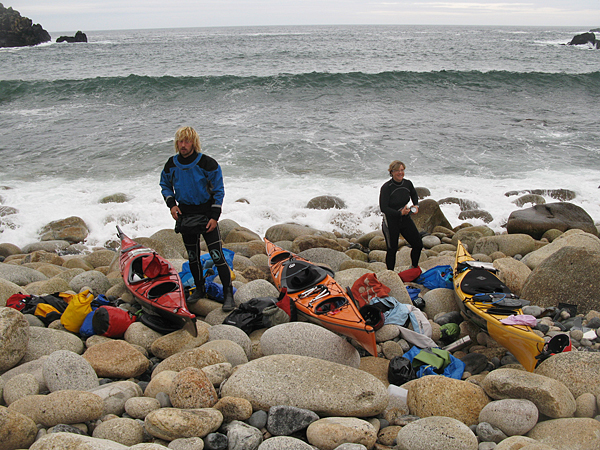 We pulled our boats up at Porthgwarra a tiny cove on the protected side of the southern headland of the peninsula. Michal and I were not quite done for the day; we poked our noses around the headland to see what was happening on the western facing shores of the UK. It was like yin and yang going around that rock; the sea transformed into something a whole lot more lively. Could this be a little preview of the following morning? Thankfully Natalie was able to sweet-talk the local harbour master and we had ourselves a 5sqm patch of grass to pitch a tent overlooking the boats in the bay. Good work! After a good hearty Czech soup for breakfast we got harnessed and helmeted and went in search of some gravity to overcome. We headed towards Chair Ladder. As a kind of warm-up, or out of sympathy for me, the novice, we took a look at the Pinnacle on the eastern side of Chair Ladder and chose a relatively easy route (HS). Terriers Tooth, up the eastern side of the Pinnacle was tough going for me but a nice warm up for my spiderlike companions. After a quick snack and nicely in sync with the tide, we were on the water again, and heading into the belly of the dragon, across one of Britain’s most exposed coastlines in search of Longship’s Lighthouse, Land’s End to the protected waters of Sennen Cove. Thankfully the sleeping dragon never quite woke and we passed the mainland’s most westerly point with nothing more than a gentle murmur and gurgle. Although the sea was relatively calm around the mighty buttresses of Lands End, there was an immense power to the gentle swell. It was long and flat and slow, and clearly it had travelled far before it crunched into the rock walls. The following morning we were greeted with a great sea view. The previous evening we had found a few square metres of relative flatness on the steep grassy slopes to the west of the town. Either we gate crashed some kind of slug convention, or they came out en masse to defend their territory. Which ever it was, I felt somewhat unwelcome on that patch of grass! This day would be about a bit of surf in the morning followed by some exploration of the cliffs of Sennen in the afternoon. Natalie rented a young blonde bronzed chap to teach her to stand on a floating board whilst Michal and I competed with surfers for the best sets – our pointy harpoon shaped manned missiles didn’t seem to deter them much!! Being my very first surf experience, it was slightly intimidating watching the waves curl and then crash thinking what it would be if I joined that process. I swam quite a lot that morning, and drank a fair bit too… but mostly with wide eyes and a big smile! After lunch, I was about done for the day, but no there was more coming… We thought we would start on the very rock face that Michal had to be rescued from after his fall a few years ago! This clearly filled me with glee! Thankfully we chose a far easier route than that fateful day. Natalie led us up Corner Crack (S) as a warm up and then Michal took us up Demo Route (HS), which seemed just too much for me and I cheated up an easier route to the side. The imminent rain chased us back to our tents where we enjoyed a well-earned meal under the shelter of the Madera’s canvass palace. A slower start saw us packed and on the water some time around midday. Our first target was the 5km bay crossing to Cape Cornwall and the Brisons Rocks (otherwise know as DeGaul in the Bathtub).The landscape north of Cape Cornwall was something to behold. There was an autumnal crispness to the air and there seemed to be a great time and depth to the landscape with visible remains from millennia of unbroken human occupation. Concentrated dramatically along the edge of the plateau above the granite cliffs are the impressive surviving remains and structures of the formerly extensive mining industry including old chimneys and ruined engine houses amidst scarred rock and open shafts. We weaved through coves and vertical headlands in and out of caves and between frothing rocky water gardens. This was one of my most magical days ever on the water. We arrived in Porthmeor Cove not knowing what to expect. We were not sure if we would be able to land safely or store our boats out of harms way, never mind find a place to lay our weary bones for the night! Natalie was first to land on the rocky shore and added some much needed décor to her shiny hull! 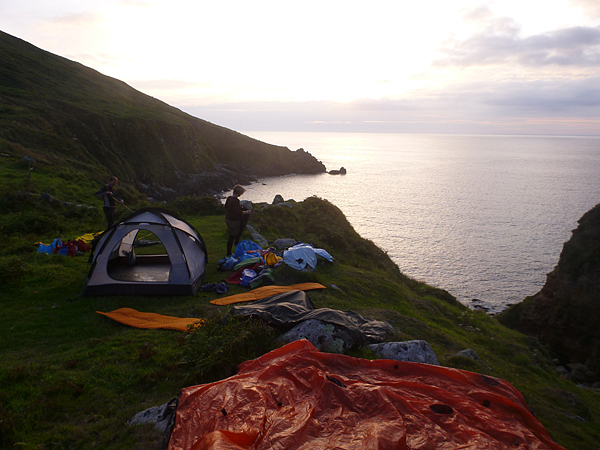 We found a perfect place to set camp and decided to stay three nights alongside the resident cows on a grassy knoll overlooking the cove towards the west. We had an interesting plan for the day which was briefly discussed around the gas cooker the night before. The idea was to retrace our steps and paddle south for a couple of kilometres up to the base of Commando Ridge, land on the rocky ledge, store our boats safely, change into climbing kit, and scale the ridge from the bottom to top. Hmmm! Another mad Czech idea that I hadn’t fully computed, perhaps? But it’s ok, soldiers did this for training in WW2 and they had heavy kit, guns and ammunition. We have super lightweight kit, harnesses ropes… it’ll be a doddle! So why was I feeling ambivalent? Thankfully the swell was on our side and all we had to deal with was that long flat sturdy cliff. We weren’t going to be tossed 20foot into the air on our first attempt. Michal went first as he seemed to be the man with the plan. I attached my towline onto his boat to hold it off the rocks while he launched himself into the water and towards the frothing granite ledge. Wide eyed, I looked on, wondering if Michal would make it onto the rocks intact while Natalie nonchalantly waved a finger as if to tell her husband that he was holding up the queue for the loo. As it turns out he did make it, dragged his boat up onto the rocks and out of harms way and before I knew it, he was shouting at me to swim in and do the same while Natalie held my boat back. Before too long we were all safely on dry land in dry clothes and harnessing up for our ascent up the ridgeline. The granite ridge towered over us like a dragon’s back with alternating giant scales pointing skyward. Michal led the route and I took a double take when I saw him struggle on the first move, I couldn’t quite work out how I would breeze up behind him on what looked to me very much like an overhang. I was told to stop exaggerating, ‘it’s a little tummy that’s all!’ So after three failed attempts and with all my limbs shaking to pieces I felt like I had had enough for the day. Just after I had shouted to Natalie that this was a ridiculous level for someone like me and her shouting back at me to stop being a baby and try a bit harder… Grrr I thought ok ONCE MORE! And I got over the tummy. Although it was technically relatively straight forward, I was very clearly at the edge of my abilities on some of those knife edges while M&N were clearly taking the piss hanging with one arm and one leg making me just want to hug the rock harder and never let go! Not funny! The 200m and 8 or 9 pitches (for my benefit I’m sure), was a delightful mixture of up-n-unders, traverses and exposed faces. Best climb ever! Once we got back onto the ledges below, we had to work out how we would launch. It was simple. I would toss my kayak into the water first, and then follow it in. Then Natalie and then Michal. Then we would all self rescue and paddle off. So I went, then Nat, then Michal. Natalie battled to get in with her buoyancy aid getting in the way and Michal’s mounted camera prevented the standard self rescue on his boat so he did the ever so stylish re-entry and roll! What followed was the almightiest of Czech arguments known to mankind – many words, high volume. Michal had filmed the launch all wrong! Back at the camp around the stove all was forgiven (I think) and we decided to stay another day and climb Bosigran’s main cliff. In the interest of mixed activities we decided to walk to our climb today, much to the horror of my non-walking companions! It wasn’t far; by 10am we were chalking up and ready to go. I mistakenly thought the plan was to take it easy with some gentle ascents but they were not getting any easier for me. It felt like a conspiracy against me, testing this sorry South African to find his limits!! Well, I found them on every bloody climb with these two! Michal led us up Ding, a 49m VS vertical drop nicely exposed to the elements. Probably the most challenging climb of the week. We finished the day on Doorpost, slightly easier but still keeping me very much on my toes! It all seemed slightly pedestrian for my companions and hopefully they did not get too irritated with my constant complaints! We hiked off in search of a pub for fresh water and dinner (some supplies were running low) but other than their generous offer of water from behind the bar, our custom was politely declined at the local well-to-do, I think on the basis that we had not showered for nearly a week! I was ominously woken by the gentle crashing waves onto our boulder beach below! I guess it’s a bit like when you set your smartphone alarm to ‘seaside’, but a bit different. We knew what we had let ourselves in for this morning. It was kind-of woven into the plan. The swell was now at least twice the size it was yesterday. Time to pack up camp, to load our boats and to bash our way through the breakers without breaking our boats. The swell was no smaller than expected and we knew this would be our most ‘interesting’ launch. Michal and I steadied Natalie and pushed her out, then Michal kindly offered to help me out and take the punch on his own. His boat filled up before he could get in and he chose to push it through sans passenger and swim in after the boat. I helped Michal into his boat behind the breakers while Natalie kept us out of danger on tow. That was quite fun, thanks Michal! It was a slog to St Ives, the tide was not strong but it was going the other way which was not helpful. We made steady progress and were pleased to reach the lovely sandy beach just around St Ives Head. The seafood restaurant served up a GLORIOUS meal, our first taste of civilisation in a week. I headed off on Cornish public transport in search of Mowzel whilst my dearest companions kindly carried boats and kit to a convenient location. We had not struck it lucky with last night’s camp site! It was a real family affair near the surf beaches… but we had our reasons. We were up and out of there in no time having a hearty fry up in a surf café overlooking one of Britain’s premier surf beaches. Natalie went off and hired an upgrade to her last bronzed toyboy and Michal and I wrestled the surfers for space. Michal went straight for some of the big waves and very soon was trying to loop forwards, backwards and whichever way is possible for a sea kayak to tumble. After a few hours playing in the white stuff, me unable to keep myself from swimming, Natalie unable to find a surf board that suited her and Michal unable to destroy his boat, we were satisfied and heading on our way to London; a fitting end to a glorious week leisurely exploring the Cornish headlands. 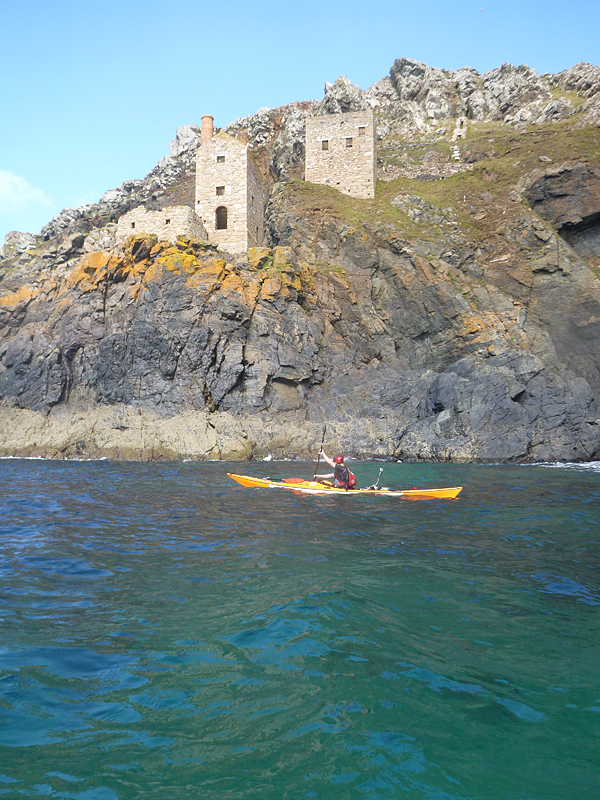 This entry was posted in Challenge, Paddling, Salt water and tagged Cornwall, by NAtalie. Bookmark the permalink.